It wasn't that many years ago that airbags and antilock brakes were considered "optional" equipment in cars, if they were available at all. Now they're standard in every new vehicle sold in the US. And automakers have continued to leverage technological advances to vastly improve the safety features available. 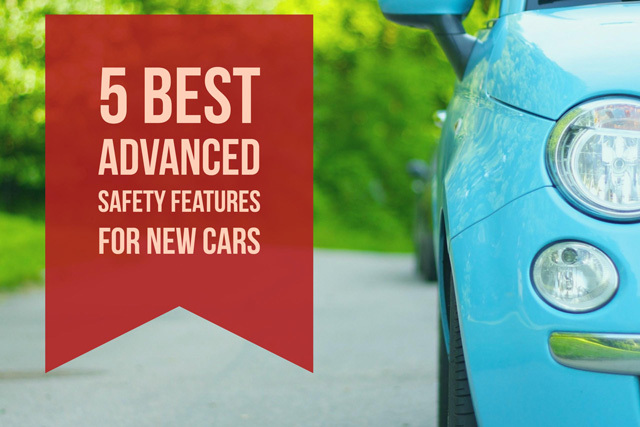 So if you're in the market for a new car, these are the advanced safety features you should be looking for when you're considering your next vehicle. Forward collision warning (FCW) systems monitors your vehicle’s speed, the speed of the vehicle in front of you and the distance between your vehicles. If you're approaching the car in front of you too fast (e.g., because you got distracted by the kids fighting in the back seat again), the FCW system will warn you that a crash is imminent, giving you time to hit the brakes to avoid (or at least lessen the impact of) a collision. More advanced FCW systems will be paired with automatic emergency braking (AEB), as well. So if you don't hit the brakes quickly enough (or with enough force) the AEB system will automatically apply the brakes to prevent a crash. In addition to vehicle detection, some manufacturers are also designing these systems to detect and avoid collisions with pedestrians, as well. Kids still distracting you? Well, if you start to drift out of your lane without using your turn signal, a lane departure warning system will give you a visual and audio heads-up so you can steer back into your lane before you cross over the center divider or run off the road. Some systems will even send vibrations through your seat cushion (General Motors vehicles) or steering wheel (Lincoln and Ford) to remind you to get back in your lane. Similar to the combination of forward collision systems and auto-braking, some manufacturers are pairing the lane departure warning systems with a lane departure assist feature that will steer the car back into line for you. The idea here is pretty simple: you're changing lanes and you don't see a vehicle in your blind spot - but the blind spot warning system does, giving you a visual and audio warning to stay in your lane. This cam also can be helpful when vehicles are approaching your blind spot at unexpectedly high speeds. The warning light is either built into the side view mirrors or the dashboard, depending on the vehicle manufacturer. According to the National Highway Traffic Safety Administration, backover accidents result in 210 deaths and 15,000 injuries annually, many of them children. A rearview camera helps reduce these tragic accidents by providing a clear image of what's behind your car, allowing you to back out of a parking space or driveway safely. The more advanced systems also incorporate "rear cross traffic" sensors that will alert you if you are about to back out into moving traffic. Beyond the safety benefits, a rearview camera is also immensely helpful when parallel parking in ultra-tight spots. Trust us, we know. We're from New York City. By May 2018, rearview cameras will be required equipment in all new vehicles. On long trips, cruise control is a welcome way to avoid driver fatigue. However, maintaining a constant speed isn't helpful when the cars in front of you are not. Adaptive cruise control systems use laser or radar signals to maintain a preset distance from the car in front of you - if it slows down, so do you - requiring far less interaction from you, the driver. Some manufacturers, such as Mercedez-Benz, are even incorporating automatic steering into their cruise control systems by leveraging the cameras used for their lane departure warning systems to detect lane markings. Autosteering will keep your car in your lane, even around slight curves (thankfully, it still requires drivers to keep their hands on the steering wheel or the system will deactivate). It's not full autodriving, but we're getting closer to that point. And adaptive cruise control isn't just for highway trips. Audi's Traffic Jam Assist provides acceleration, braking and steering even while at a crawl. Which cars have advanced safety features? Auto manufacturers are constantly expanding these advanced auto safety features across their lineup, even to their lower-priced models. Consumer Reports has a very helpful search page that will let you see which of these safety features is standard, optional or not available for every model from each manufacturer. Gonna look into a new Toyota, they’ve been doing a ton of upgrading to the new ones. Nice Collection and sharing of safety features of cars such kinds of cars are not easily available everywhere may be this site Website: http://alwakalat.com could be a better choice for someone.